King of France, third son of the Dauphin Luis and María Josefa de Sajonia; and grandson of Luis XV. He/She was born in Versailles in 1754 and died in Paris on January 21, 1793. 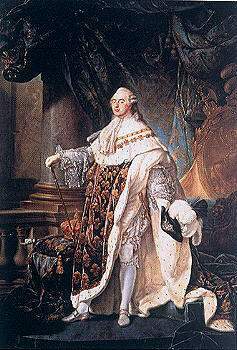 He succeeded his grandfather in the throne in 1774, after the death of his father and older siblings. In 1770, he/she married María Antonieta of Austria, daughter of Emperor Francisco I, Duke of Austria. The Queen was always hugely unpopular, already that their status as foreign joined their extravagant way of life, often outrageous, and all a court's reactionary plotters and privileged opposed all kinds of measures modernizadoras. If this out shortly, the Queen he/she exercised a powerful influence in her voluble husband, who in the eyes of the people was not more than a "puppet" in the hands of a cruel Queen. The first measure of Luis XVI was, however, very popular, since it consisted of removing the triumvirate that ruled the country from the last years of the reign of his grandfather. But the King was more interested in marquetry, geography, hunting and the pleasures of the table than in the Affairs of Government, which left always in the hands of third parties. His reign began with the ascent to power of Maurepas, who came to replace the triumvirate. He/She also restored the Parliament of Paris and appointed a new Cabinet in which highlighted the figures of Malesherbes, Sartines, Saint-Germain and Turgot. The latter imposed economic measures aimed at the liberalization of the market economy, mainly grains and the radicalization of the tax system. This pitted him the traditional aristocracy, grouped around the Queen, and the masses, outraged by the rise in commodity prices. Due to this opposition, the King replaced his Minister in 1776 by Necker, who remained in office until 1781. Despite the policy of budgetary facilities initiated by Necker, this soon came into conflict with the privileged classes, who refused to accept any kind of change in their privileges. The difficult economic situation eventually deteriorate due to the extraordinary expenses of the French intervention in the American war of independence (see independence from the United States) between 1778 and 1783, which ended with the peace of Versailles, by which France obtained the return of Senegal, Tobago and St Lucia. The intervention was advocated by Vergennes, responsible for foreign policy, and despite the success of the campaign, the results for the economy were terrible. Necker exposed the desperate situation to the King in 1781, which provoked the indignation of this and the immediate dismissal of the Minister of finance. He/She was replaced by Calonne, who made a last-ditch effort to save France from the economic morass in which was, but like the previous Ministers collided with the privileged groups and was dismissed in 1787. Since the beginning of the Decade of 1780 had arisen in France a stream of liberal thinking, which, coming from the ideals of the Enlightenment, was gaining strength among intellectuals and the middle classes, which had as an example the young American democracy; This self-styled Patriotic Party criticised the ineptitude of the monarchy to the problems of public finances, by not being able to put an end to feudal privileges. The total crisis in the economy, coupled with the political situation, forcing the King, in 1788, to convene the States-General and bring back Necket in charge of the finances of the State. In the States General the King acquired some popularity with the people thanks to the decree which granted the third estate the double vote, but failed to take advantage of it. The Patriotic Party was erected in the States as a representative of citizenship and assumed the authority to reform the State for the sake of the well-being of all. This decision, adopted in 1789, marked the start of the French Revolution. To the obstinacy of the King and of the privileged assume the changes that the nation cried, members of the third estate was conspired and took advantage of the Parisian streets popular mobilization (movement that originally was nothing one of the revolts by food), events that concluded in the storming of the Bastille on 14 July 1789. At these events the King was forced to accept the reforms raised by the third State. The third estate became the General State National Constituent Assembly. Negative regia to sanction the Declaration of the rights of man and the decrees that abolishing the seigniorial regime, led to the uprising of October and forced the King to settle in Paris. June 14, 1790 the monarch swore the revolutionary Constitution, so it won the favor of the people, but unable to accept the new order. Luis XVI asked for help to the European powers. Fearing for his safety, Luis XVI decided to leave Paris to call on his army and carry out a counter-revolution, but was arrested at Varennes and taken back to Paris in June 1791. Since the powers of the monarch were minimal, so Luis XVI tried to degrade the situation until it becomes anarchy, thinking that this would make the people to return their confidence toward it. To this end, he/she intrigued against the moderates at the time who encouraged supporters of the war, while it was expected that the French army was defeated. The situation came to an end unsustainable, which eventually lead to a new outbreak of revolutionary. On 10 August 1792, extremist groups stormed the Tuileries Palace and Luis XVI was imprisoned with his family in the Church of the Temple, where he/she came to appear before the Convention. Sentenced to death by the people, he/she was guillotined on January 21, 1793. This caused a great impression throughout Europe and was the last reason for the different absolutist powers of the continent formed a grand coalition against France (see wars of the Convention).